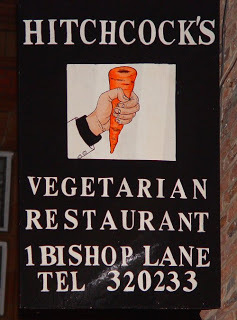 If I am often wondering about the lack of vegetarian restaurants in Manchester, perhaps it is less surprising that there are hardly any vegetarian restaurants whatsoever in Hull, East Yorkshire, the dreaded city of my growing pains. What is very surprising then is the fact that my favourite place to eat is in that very city, and furthermore that it is vegetarian. 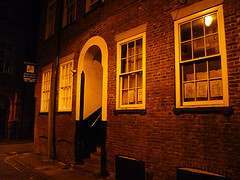 Hitchcock’s is found at the top or bottom of Bishop Lane, depending on where you’re coming from, in the characterful heart of the historic old town, situated along the town-side bank of the river Hull. Ring the bell and you are ushered up the stairs into surroundings which reviewers of lesser imagination might deem ‘quirky’. 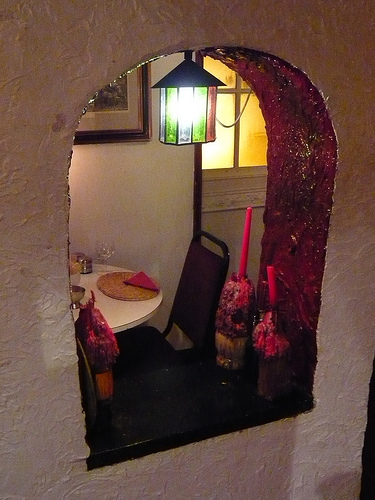 In keeping with its otherworldly, glowing and cosy grotto-like layout, the restaurant operates on a unique basis: the food served is part of an all-you-can-eat buffet, while the type of cuisine varies from night-to-night, depending on the preferences of whoever books first. For instance, I have experienced Indian, English and, most recently, Persian/Middle-Eastern themed nights. All of which have been fantastic. Almost best of all is that specialist diets are readily catered for provided advance notice is given. At the Persian night, Bruce made sure I was shown round the buffet so that wheat-filled delicacies could be pointed out and avoided, before presenting me with a huge platter of delicious spinachy stuff spread on gluten-free bread. Better than this, however, is the vast cake selection. It is fantastic… if a little damaging if you have PCOS and must therefore limit your refined sugar intake (note to self: will in future ask for cakes featuring alternative sweeteners). People at our table for my friends’ Linda and Espen’s wedding reception hadn’t even started on the main course before making reference to and recommendation of the magnificent pecan pie. The Tiffin is also remarkable.